The technology company Continental has extended the services of its fleet management software VDO TIS-Web by adding numerous functions and redesigning the user interface. The software that gives dispatchers for small to mid-size fleets a comprehensive overview of their drivers and vehicles will now have features as geofencing and push notifications. 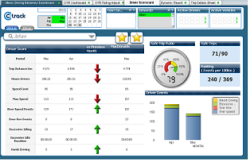 Fleet managers can now get information in real time like location my drivers and vehicles, driving times and rest periods, how are they being utilized. Thus, dispatchers can react just as quickly, e.g. to take on additional loads or modify routes. New functions now make planning even easier and more manageable. For instance, the routes of all vehicles can be tracked directly in a map view. For better differentiation, the different trucks can be shown in different colors. When the user clicks a vehicle symbol with the mouse, a popup window appears with detailed information. In addition, filters enable a quick search to find out load capacities or the availability of a driver. In the driver and vehicle overviews, there are practical lists of shift details, remaining driving times and driving and resting times. The data is also retroactively available via the report function. A new translation function further simplifies handling. With the feature of geofencing, If the vehicle crosses a preset boundary on the map, a notification automatically appears on the dashboard. This enables transport companies to announce the precise time, to the minute, of when a delivery will arrive. In turn, this accelerates loading and unloading processes and minimizes vehicle downtimes. Push notifications are also new. Fleet managers can configure, for themselves, the events they want to trigger notifications. When they receive a notification of a tire pressure problem, for instance, the problem can be corrected faster. Anticipatory maintenance maximizes operating hours while saving fuel. Continental has also redesigned the user interface to give fleet managers all of the information that is important to their work at a glance.